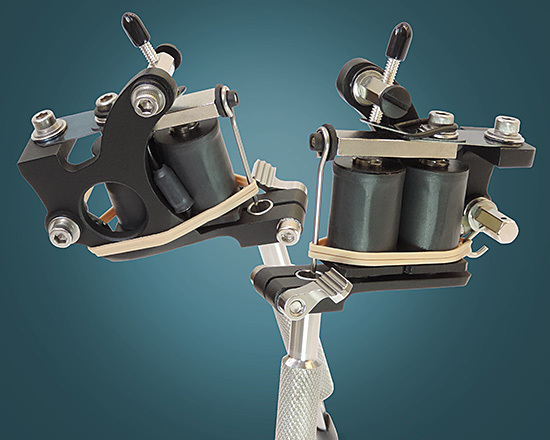 Rich, flat black powder coating makes this the best Stinger tattoo machine ever! We started with a wide slot quick change iron frame and powder coated it in a rich, flat black. Then we bolted on old style hand wound ten-wrap coils. Add to that blue finish two piece springs without contact point, sterling silver contact screw, nickel plated binding posts, all stainless steel screws, our patented (#D356,944) LeeverLoc fastener device and our famous stainless steel tube with built-in grip. Now that's a machine! Set up as a liner. The Stinger is not available as a shader.